Forty-five years ago today, October 5, 1970, I trusted Christ as my Savior. The scales from my blinded eyes were removed and I realized I had sinned against a holy God, but our Creator God became the Redeemer of humanity in Jesus Christ. He who knew no sin became sin for me that I might become the righteousness of God in Him. Ah, amazing grace!! Over the last forty-five years I have been asked many times, “Why are you a Christian?” I will answer that question with one of my favorite stories from the days of the Roman Empire. There was once a wealthy Roman senator who had become most influential in the political arena. He desired that his only son follow him into politics, but his son was not interested in governmental affairs. His son was more interested in living a life without restraint and indulging in behavior that brought heartache and shame to his well known father. In time the young man left home with his partying companions to live a life of reckless abandonment. For a while he kept in touch with his father, but as time passed their relationship become more and more strained and all contact was discontinued. That broke the father’s heart, but what could he do. He continued to faithfully serve as a Roman Senator, but he realized as time passed he would not see his wayward son again. As the wealthy senator grew older he decided to change his will, which had stated everything was to go to his only son. Presuming his son was dead, he rewrote the will and left his vast wealth to his trusty servant who had been with him most of his life. However, he made one stipulation in the will, that if his son ever returned he was allowed to choose one thing from his estate. Not long after revising his will the Senator passed away. A most influential man, word of his passing spread throughout the Roman Empire. Word of his passing eventually made it to the ears of his son. Heartbroken at hearing of his father’s death, he realized how he had wasted his life and had broken his father’s heart. Repentant, he made his way back home. Upon arriving he was told of his father’s change of the will. He was informed his father’s vast wealth was to go to the faithful servant, but he was allowed to choose one thing from his father’s fortune. His heart raced as he thought to himself, “What shall I choose?” He pondered and he pondered. Then suddenly, like a flash of light, his eyes were opened and it dawned upon him what should be his choice. Twirling around and pointing at the faithful servant, the son exclaimed, “I will take him.” For the young man realized that wrapped up in the faithful servant was all that his father possessed and to possess the servant was to possess all that belonged to his father. That story is the answer to “why I am a Christian.” Forty-five years ago my heart cried out, “I will take HIM.” On the night of October 5, 1970, my eyes were opened to gloriously see that wrapped up in the Faithful Servant, Jesus Christ, is all the Heavenly Father possesses and to possess Christ is to possess all that belongs to the Father! WHAT DETERMINES ONE BEING A CHRISTIAN? There seems to be much confusion today about what determines one being a Christian. 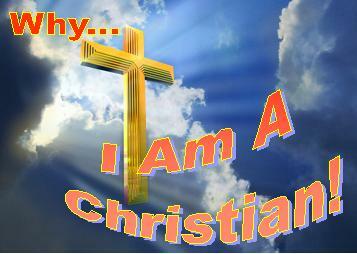 Many say they are Christians, but they have a misunderstanding what determines whether one is a Christian or not. I read a b log not long ago by an atheist who said he resented not being considered a Christian, because after all he said he sought to live his life by the teachings of Jesus. I have had people tell me they were a Christian even though they didn’t believe in the divinity of Christ and see the cross as a necessary component of Christianity. Is it possible to deny the divinity of Christ and the necessity of the cross and be a Christian? People have some confusing ideas about what determines one being a Christian. Just because one quotes the Bible verbatim doesn’t make them a Christian. Just because one attends church doesn’t make them a Christian. Just because one seeks to follow the teachings of Jesus, as noble as that is, doesn’t necessarily make them a Christian. Just because one sees Jesus as a great moral teacher doesn’t make them a Christian. Just because one believes in a Higher Power, a Creator, doesn’t make one a Christian. Just because one hangs around other Christians doesn’t make them a Christian. Just because one seeks to love their neighbor, which we should all seek to do, doesn’t make one a Christian. Just because one was born into a Christian home doesn’t make one a Christian. What then makes one a Christian? One is a Christian who recognizes they have offended and sinned against a Holy God and embraces the Christ of the Cross who the Holy-Father has provided as the Perfect Sacrifice and Paymet for the sin-debt each of us owe, but which we could never pay. You see, you and I and have a big problem that must be dealt with – it is called sin. Because God’s nature is holy He opposes sin. God’s holy-love demands that man either render unto Him perfect holiness or pay the just judgment for not being able to comply with His holy demands. God’s holiness opposes sin and demands it be dealt with in judgment, yet God’s love longs to forgive us. The answer to God’s “dilemma” is found in the Christ of the Cross! It is in the Christ of the Cross judgment upon sin and the provision for the forgiveness of sin meet in a divine solution. The marvel of the Christ of the Cross is that the holy-love of God accomplished in Christ what we could never accomplish and never do. Christ, as our Representative, by His perfect life complied with the righteous and holy demands of God and then on the cross He took for us the just judgment we deserve for being unable to comply or conform to the holy demands of the Creator. We are all guilty, we have all failed, we have all sinned and come short of what God would have us to be (Romans 3:23). A Christian is one whose conscience and spirit has been awakened by the Holy Spirit to realize they are guilty before a perfect and holy God, they have failed and they have sinned against His holiness, but knells in acceptance and submission to the Christ of the Cross recognizing He did for them what they could never do for themselves. A Christian is one who recognizes that in Christ our Creator became our Redeemer, and in eternal gratitude embraces Him as Savior. A Christian is one who realizes that Jesus paid the sin debt for them; that He and He alone is the perfect provision for ALL our sins, and that He alone enables them to stand before the God of the Universe uncondemned and their sins forgiven. A Christian is one who in wondrous amazement is thankful for what Christ did for them on the cross and willingly submits their allegiance to follow Him. A Christian is one who sees Jesus as more than a prophet, teacher, or a moral example, but who sees Him as their Lord and Savior. A Christian is one who when they sing “Amazing Grace” can do so with joyful confidence that His grace is truly amazing because the holy-love of God provided in Christ the solution to the vileness of their sin and the deserved judgment upon it. A Christian is one who has come to realize that Christ in His living, His dying on the cross and in His resurrection, He as their Substitute, was doing and providing for them what they could never do or provide for themselves. A Christian is one who upon embracing Christ’s perfect and finished work on the cross, begins a lifelong journey of following the Savior and Captain of their salvation. A Christian is not perfect, but they walk daily with a Savior whose perfect provision on the cross for their sins was perfectly accepted by the Father. A Christian is not one who is striving for acceptance before the God of the Universe, but one who joyfully embraces their acceptance that has already been provided for them by the holy-love of the Father in the prefect provision of Jesus Christ. There is much confusion today about what a Christian is, but it is really very simple. We find what it means to be a Christian in the response of Thomas when He was confronted with the Risen Lord. Thomas, upon the examination of the nail prints of Jesus, which He willing received on Thomas’ behalf, fell down at His feet in wondrous acceptance and awe and cried out in belief, “My Lord and my God” (John 20:24-29). One truth is certain, once you encounter the Christ of the Cross and embrace in believing faith what He did for you, you will never be the same again. Then you will understand what determines one being a Christian. Forty-four years ago this week I trusted Christ as my Savior. I realized I had sinned against a holy God, but our Creator God became the Redeemer of humanity in Jesus Christ. He who knew no sin became sin for me that I might become the righteousness of God in Him. Ah, amazing grace!! 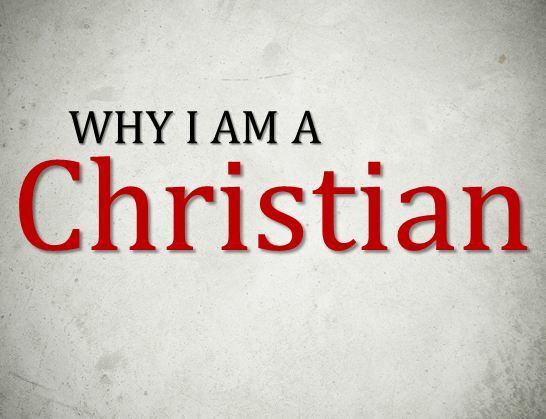 Over the last forty-four years I have been asked many times, “Why are you a Christian?” I will answer that question with a story from the days of the Roman Empire. There was once a wealthy Roman senator who had become most influential in the political arena. He desired that his only son follow him into politics, but his son was not interested in governmental affairs. His son was more interested in living a life without restraint and indulging in behavior that brought heartache and shame to his well known father. His heart raced as he thought to himself, “What shall I choose?” He pondered and he pondered. Then suddenly, like a flash of light, it came to him what should be his choice. Twirling around and pointing at the faithful servant, the son exclaimed, “I will take him.” For the young man realized that wrapped up in the faithful servant was all that his father possessed and to possess the servant was to possess all that belonged to his father. That story is the answer to “why I am a Christian.” Forty-four years ago my heart cried out, “I will take HIM.” For I realized that wrapped up in the Faithful Servant, Jesus Christ, is all the Heavenly Father possesses and to possess Christ is to possess all that belongs to the Father!